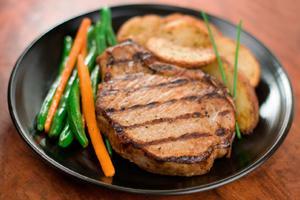 Veal chops recipes create one of the most protein dense meats available. If you're concerned about your waistline and getting bored with the same old meals, consider veal chops. They provide all of the essential amino acids making them a complete protein. One 3-ounce, pre-cooked chop contains 27 grams of protein, 5.6 grams of fat, and 166 calories. Veal chops are one of the leanest cuts of meat available. Dry heat is the best way to cook this delicately flavored meat. Examples include roasting, grilling, broiling, or pan-broiling. Veal chops readily absorb other flavors so care must be taken not to overdo the seasonings or you will lose the taste of the veal. These chops are receptive to herbs such as thyme, tarragon, rosemary, and garlic. If your veal chop recipes calls for a marinate, it can be done in as little as 15 minutes. Due to the extreme tenderness of this cut, anything longer than 24 hours will leave it with a mushy texture. The most treasured veal chops recipes hail from French and Italian cooking and their price point is a tad expensive. Don't let those two details prevent you from delving into an extraordinary eating experience. Pair the deliciousness of veal rib or loin chops with a glass of Chardonnay or a medium-bodied Merlot for a high-end meal right from your kitchen.